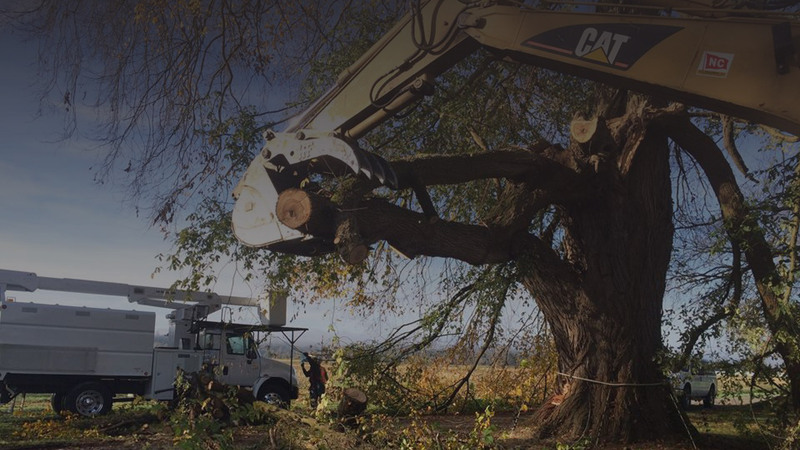 Puget Sound Tree Care is a professional, family owned and operated full service tree company. Let us put our 35 years of experience to work for you. 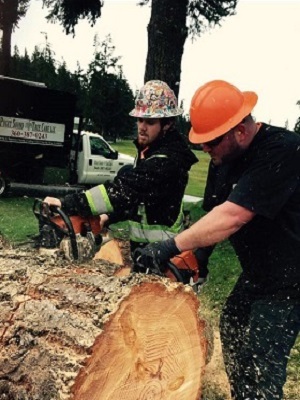 Puget Sound Tree Care is a professional, family owned and operated full service tree company. 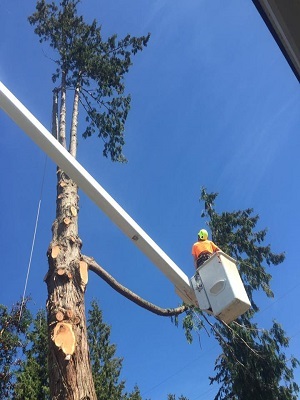 We have over 35 years of experience in the Puget Sound area and take pride in providing personalized tree care to our customers including tree removal, tree trimming and stump grinding. We guarantee customer satisfaction as well as a clean, safe working environment. 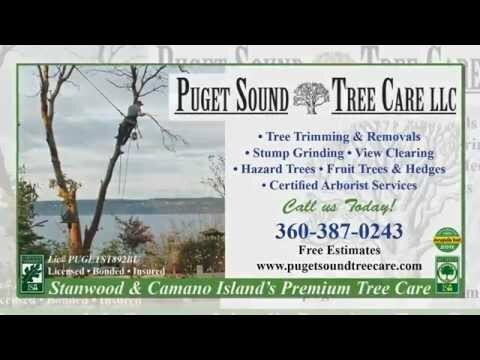 Puget Sound Tree Care serves North Puget Sound and Camano Island. PSTC is Licensed, bonded and insured (lic#PUGETST892BU). We have 2 full time ISA certified arborists on staff. Our employees work diligently to ensure that our customers needs are met to the fullest. Five days after presenting us with a bid substantially lower than any we had received, Puget Sound Tree Care removed 2 medium trees, several smaller trees, and several shrubs, from a neglected, overgrown portion of our property. The owner and his employees were without exception professional, knowledgeable, efficient, and very friendly. We were amazed at the outstanding job. We highly recommend this company. Puget Sound Tree Care took out seven Maple trees in back yard, some quite close to the house. Removed an Alder and Hemlock near driveway. Removed many small trees near the house. Cleared the yard of tree remains. Chipped all the wood for use on trails in the yard. 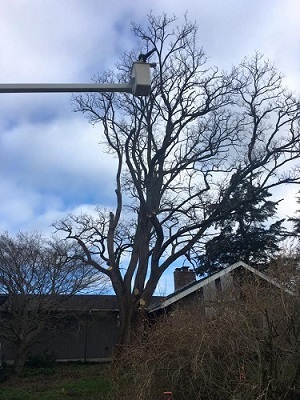 This is the second time Puget Sound Tree Care has done work on our trees. They came on short notice and got the job done promptly in time for the gardeners to start their work. They performed the work as promised and even did more than asked. They gave lots of helpful advice. Other tree service companies came and tried to scare us into expensive tree pruning work that is completely unnecessary. 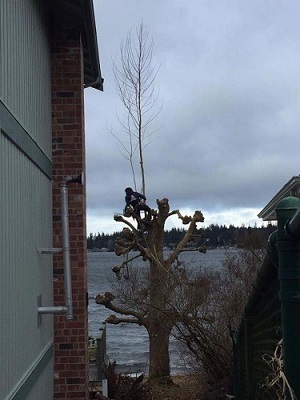 Puget Sound Tree Care is a good, honest company. 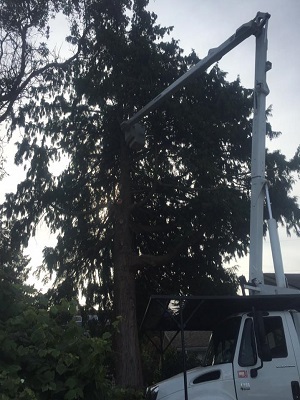 Puget Sound Tree Care removed a western white pine in our backyard. It went very well. They arrived as scheduled, in fact a bit early. When they gave us our bid, Jim said it would take 1.5 hours. They were done in 45 minutes. They cut the wood into 16″ lengths as planned. The rounds were in a neat pile around the stump. All the limbs were removed. No mess remained when they were done. No damage was done to the adjacent shed or plants. They did a great job. Puget Sound Tree Care removed a 60ft dying pine tree from our back yard and trimmed back a large pine tree on the road. They took the trunk rounds to a pick up area (giving free to someone who needs firewood). Cleaned up both areas (these are guys after my own heart). Came exactly on time. They were very efficient and professional. They were prompt, courteous, and pleasant. No mess to clean up when they were gone, Careful not to have any branches go into our neighbor’s yard, Great job! 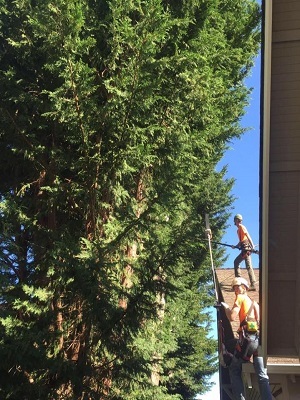 Puget Sound Tree Care removed four large trees on our residential property. I obtained three bids prior to making my selection. The bid was made by the owner who was also present when the work was done. Their price was competitive. All personnel were knowledgeable and professional. The work was completed on time and according to the estimate. A boom truck was brought and used most skillfully to ensure the security of nearby buildings and garden plants. My neighbor was so impressed that he arranged for them to return to perform tree removals on his property at a later date. I would highly recommend this company. Puget Sound Tree Care pruned a very, very overgrown hedge, cut tree limbs and all the dead branches from the lower portion of about ten additional trees. I had 1 Douglas fir tree in the front yard and 8 close quarter red cedar trees in the back yard. The tree in the front yard I asked to be cut into firewood rounds. I wanted the 8 trees in the back cut into 20′ sections and hauled to a local mill to sell. I received 6 bids before choosing Puget Sound Tree Care. 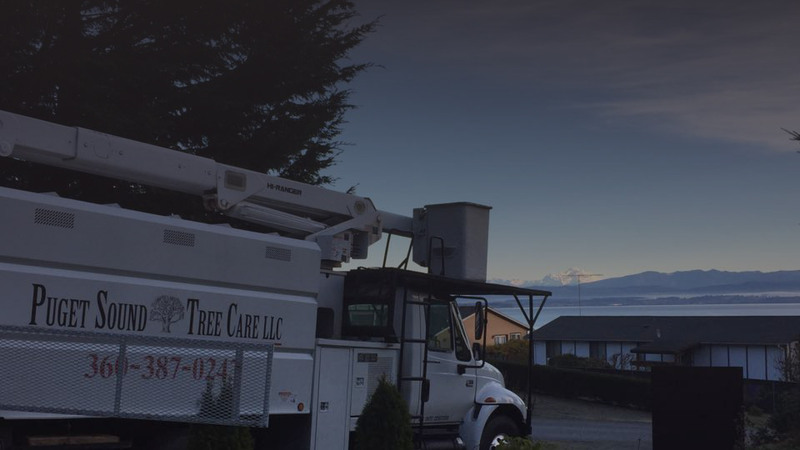 I chose Puget Sound Tree Care because of their professionalism, the knowledge, the thoroughness of their bid and honestly their confidence. Once I decided to hire them and chose a date, they took care of everything. They arranged with Comcast, Frontier and PUD to have our lines dropped. They arranged the crane service company. They arrange the logging truck. I literally got to sit back and let them do their thing. As for the actual work, it is fantastic. They showed up when they said they’d show up and worked hard all day long. They had the Douglas fir in the front yard down in less than 4 hours… that is taking all the branches off and cut into firewood rounds and cleaned up. They worked just as hard on the trees in the back yard. They always cleaned up before they left for the day even if they were coming back the next day. I will be recommending Puget Sound Tree Care to anyone and everyone that needs tree service of any kind. Puget Sound Tree Care cut down 2 cedars (approx. 40ft tall), and 4 firs (approx. 50-70 ft. tall). They chipped up all the branches, cut up the wood, and hauled everything away. Then all the stumps + one existing stump were ground to below grade. Since their work schedule was quite busy, we had to wait a month to get scheduled. But as promised, Jim and his crew showed up promptly at 8:00 and got to work. And boy did they work! The entire job took less than 6 hours. Everybody was very friendly, and were more than happy to answer any questions that we had. They took care to avoid damage to the property, even keeping a screen up during the stump grinding so that no rocks were sent flying towards the house. And considering all the debris that this job created, they did a good job of clean up at the end. A month after this work was done, we realized that there were 3 more firs that needed to come down. In less than 2 hours, Jim and the guys had everything cut up and hauled away. Another good experience! Puget Sound Tree Care cut down and removed two trees in our front yard, which had become problematic with roots breaking up our brick walls and asphalt driveway. These guys do a great job. They have done excellent work for us in the past and we will definitely call on them again. The owner is very professional, conscientious and efficient. He gave us a competitive bid, showed up ahead of time and completed the work himself with one of his crew within an hour. They had the trees cut, chipped and the area cleaned up looking better than it did before they came. We had flowers, shrubs and a lamppost right under the trees, which came out of it untouched. They even cut the trunks into nice-size rounds for us to use for firewood. We hated to see our trees go, but the place looks so much better now thanks to Puget Sound Tree Care. 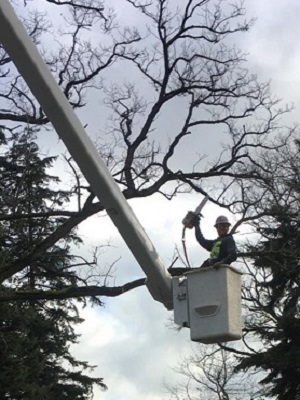 We had Puget Sound Tree Care consult with us to assess the tree health on our property, which trees would thrive in our soil and climate and a 2nd opinion on the advisability of removing a row of trees along the roadway. PSTC service was excellent. They are professional, and service oriented (even came out on a Sunday). 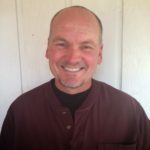 I have consulted with a few on our landscaping and trees and occasionally you run into someone who really seems to know their stuff from a gut level…Jim with Puget Sound Tree Care is just such a person. From a lineage of loggers (fourth generation) and an arborist, he knows trees. He immediately spotted issues with our trees and knew how they got that way. He offered sound advice, which I am implementing. When I offered to pay him, he refused and said it was part of his service. As we are on Whidbey Island it is too far for his crew to travel for small jobs but I will call him first when our project is of sufficient size hopefully to make it worth the trip. Puget Sound Tree Care did a complete overhaul on a huge huge hedge. Did a great job! Cleaned up all branches, leaves etc. Worked non-stop. Would recommend to anyone looking for tree service. 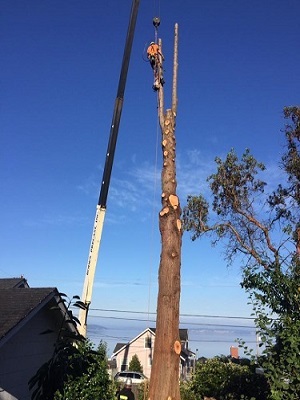 We can remove a tree professionally and safely, regardless of the size or location of the tree. We live in an area with great natural beauty but tree growth can obstruct desired views of the sound, lakes and mountains. View clearing removes unwanted trees and shrubs from your bluff or inland property that impedes your view. 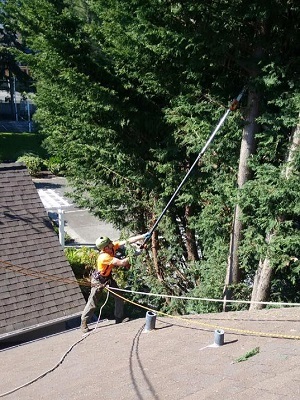 View trimming involves selective trimming, and crown reduction methods that still maintain the integrity of the trees. We offer homeowners and developers Certified Hazard Tree Assessments performed by an ISA Certified Arborist and Risk Assessor. All city and county planning departments as well as personal/homeowner Insurance agencies accept these assessments. The removal of lower branches is a method of pruning to provide clearance for buildings, vehicles, pedestrians, and vistas. It can also make your yard look less cluttered, improving the curb appeal of your home. Stump grinding is a process in which a machine with a large cutting wheel grinds the stump to approximately 6”-10” inches below grade. In some circumstances the structure and location of the stump may dictate the depth of the grind. 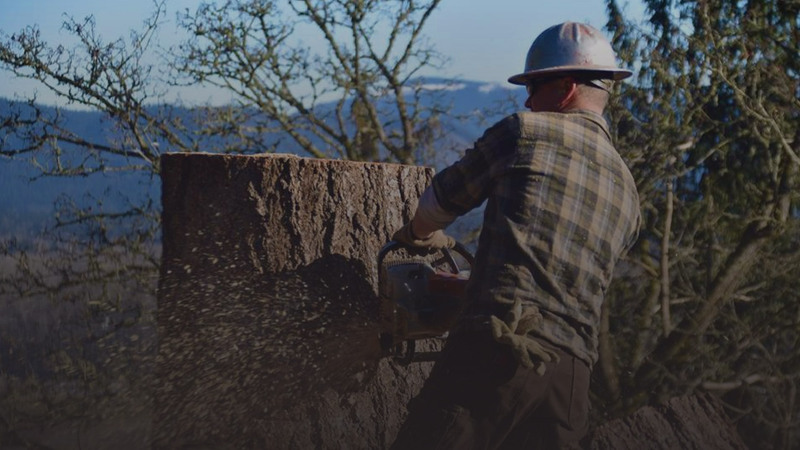 We have over 35 years experience in the logging business. We can harvest merchantable timber from both residential and privately owned land. We will be happy to give you a no cost estimate as to the value of your trees. When we prune and trim trees we follow strict ISA tree pruning guidelines to improve the tree’s health and enhance its structure. 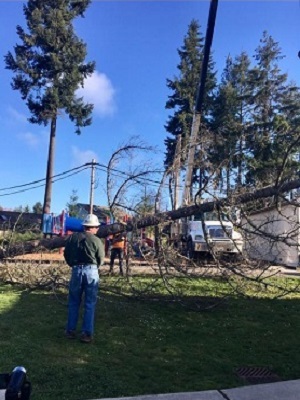 Puget Sound Tree Care is available 24/7 to respond should a tree or large limb fall or threaten to fall on your home or property. If you have a dead or dying tree that is hazardous, we have the experience to handle the problem safely. Puget Sound Tree Care offers free woodchips. Woodchips can be used for many different purposes including flowerbeds and areas where you would like to keep weeds to a minimum. The woodchips come from our daily tree trimming and removals and may contain several different tree species. We will deliver a full truckload to you that contains 15-20 yards of chips and you will be asked to describe where you would like us to leave the woodchips; our trucks must be able to have access to your designated spot. We generally deliver to the address closest to our jobsite. PSTC is Licensed, bonded and insured. Puget Sound Tree Service offers free woodchips. Contact us if you would like to request free woodchips. Call 360-387-0243, email or submit a free estimate form to the left. We service the entire North Puget Sound region which includes north King County, Snohomish County, Skagit County and Camano Island.